The cystic artery is part of the components of Calots triangle. The cystic artery is the main supply towards the gallbladder. Hepatic artery proper is the extension of the common hepatic artery. On the porta hepatis it produces right and left hepatic arteries. 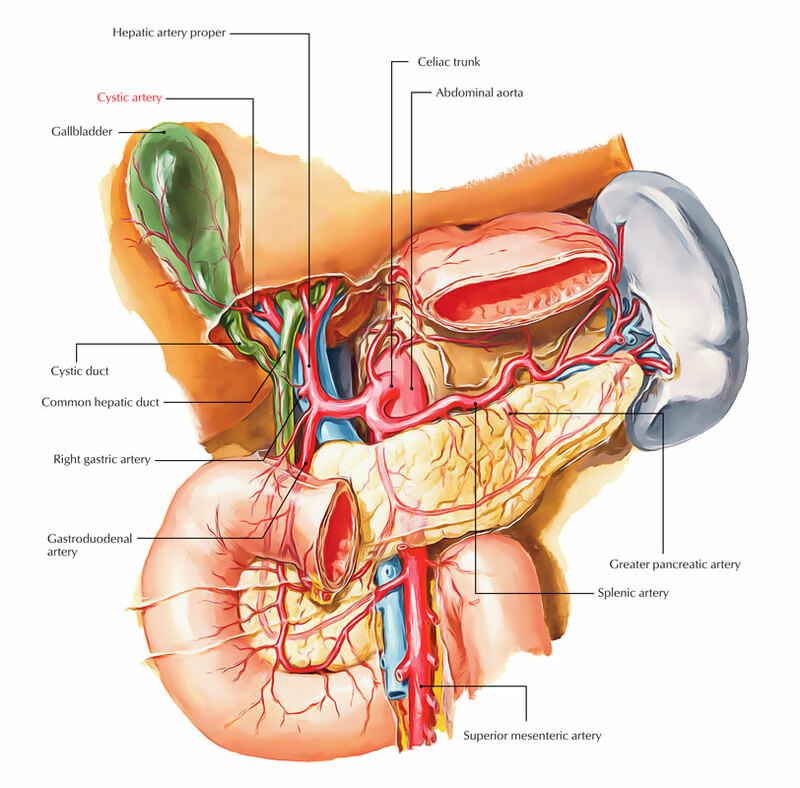 In order to supply the gallbladder the right hepatic artery gives rise to cystic artery. The right and left hepatic arteries supply the right and left physiological lobes of the liver. Anterior or superficial section travels sub-serously towards the left of the gallbladder. Posterior or deep section travels among the gallbladder as well as the liver parenchyma and terminates at the peritoneum on the liver surface; this produces small sections which supply the gallbladder, and anastomose together with the superficial sections. Cystic veins do not go along with the cystic artery, but the venous drainage of the gallbladder is via various small veins precisely within the liver via the bed of the gallbladder and/or within the right portal vein inside the liver. It most commonly emerges via the right hepatic artery within Calots triangle. Now it produces two-to-four minor sections, called Calots arteries which supply the cystic duct. To connect with the neck of the gallbladder the cystic artery travels posterior towards the cystic duct. Developing with a frequency of 15%, when superficial and deep sections of the cystic artery do not share a general start, it is called a double cystic artery. With the most frequent variation arising from an aberrant beginning of the right hepatic artery which is explained in between 2-16% of cases, unique anatomy of the right hepatic can on its own influence the path and shape of the cystic artery. This scenario is found in approximately 1% of cases. The cystic artery can emerge through the left hepatic artery, and within such a case it generally goes via a passage of liver parenchyma, coming close to the neck of the gallbladder, prior to bisecting within ascending or superior and descending or inferior sections. In lower than 1% of patients a type called a recurrent cystic artery is discovered the cystic artery emerges from the left hepatic artery and enters either the cholecystoduodenal or cholecystocolic ligaments, towards the duodenum along with transverse colon each attaching the gallbladder, accompanies the right edge of the hepatoduodenal ligament, and attaches to the fundus of the gallbladder just before going down to supply the body and neck.